My Auntie gave me a massive bunch of bananas today, they had just gone past their firm stage. She's been so busy she hasn't had a chance to eat them. If this has happened to you, do not bin them! Just grab a simple viccy sponge mix and add the banana's. Perfect. This is a really great bake for children too, I made this with my Brother, Nye. He had so much fun, he tried eating some raw vanilla essence too behind my back! Don't know how nice that tasted, he didn't try to do it again. haha. Looking a bit scruff, some naughty fingers stole a few when I went to get the camera! They really need some crushed walnuts for next time I think. 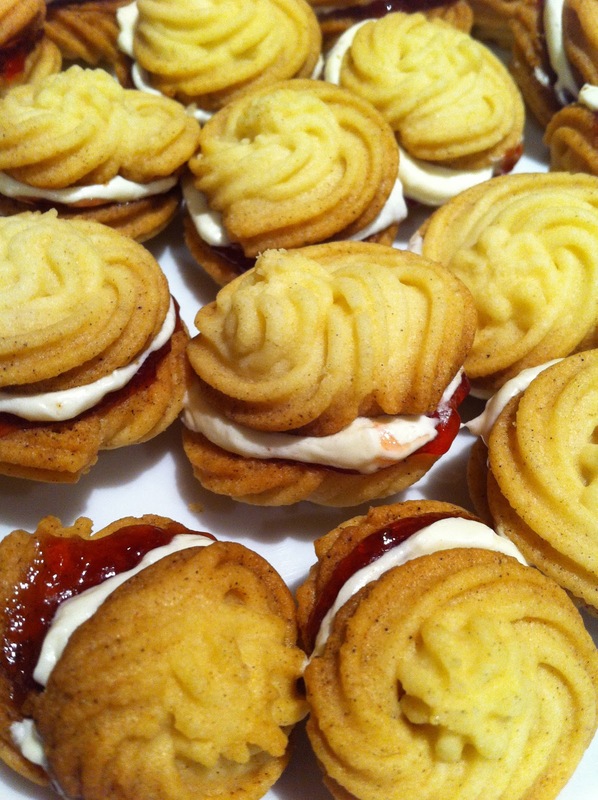 I decided, the oven was hot and I'd seen these on tv recently so hey, why not... some Viennese whirls. More naughty fingers, my little brother named this 'the big mini mac sandwich' I wouldn't recommend it, but he managed to get it down in one. I decided to make teeny tiny ones, just because they're alot easier to pipe. 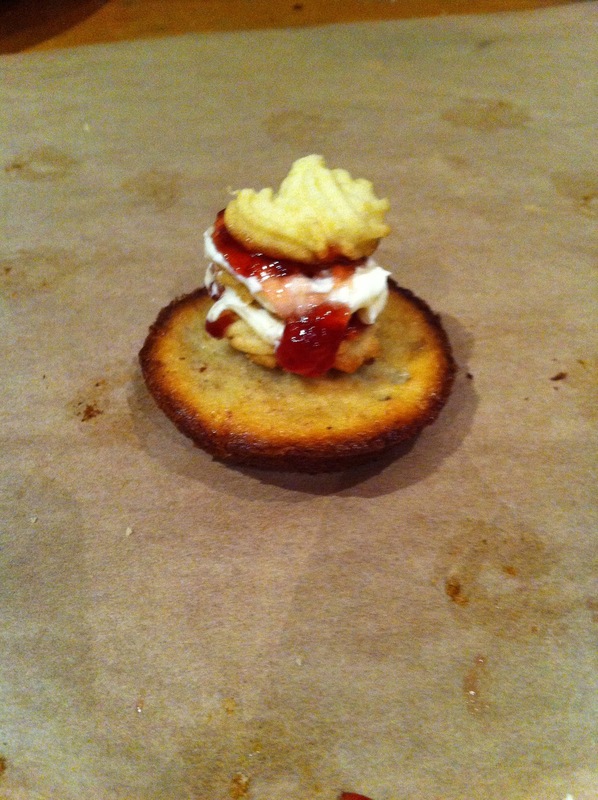 The mixture started drying in the piping bag and it got really stiff. But they still tasted really nommy. 4. Slice the 3rd banana thinly and add 1 layer to each cupcake. 5. 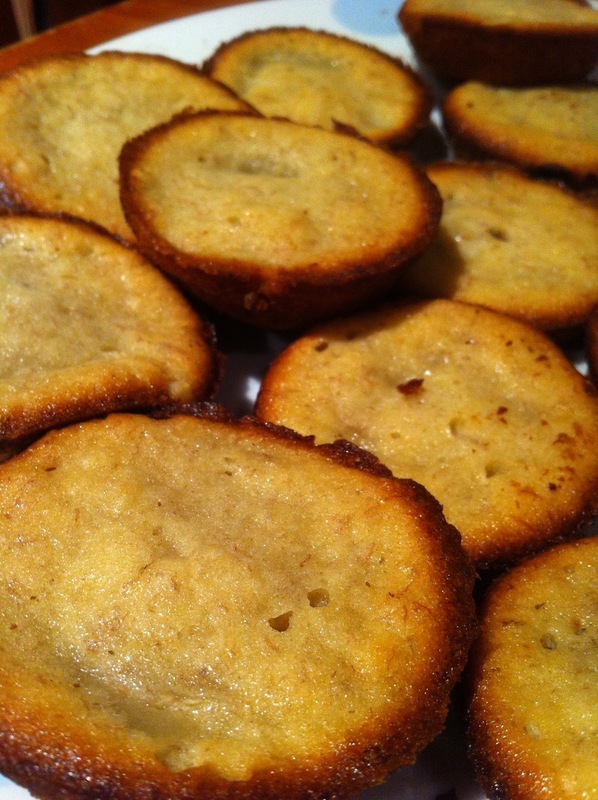 Fill the cupcake with a tablespoon of mixture over the banana. 6. Cook for 25 minutes or until golden brown. Tip - if you can't get your cupcakes out easily, you didn't grease enough! Grab a tablespoon to help scoop them out. 1. (Preheat oven at 180 degrees) Beat the icing sugar and butter with a wooden spoon or electric mixer until light, pale and fluffy. 2. Add the vanilla and beat again. Now add both flours by sifting and mix well until smooth. 3. Spoon mixture into pipping bag and pipe onto baking parchment or grease proof paper. 4. Cook for 10 minutes or until golden brown. This will vary with size. 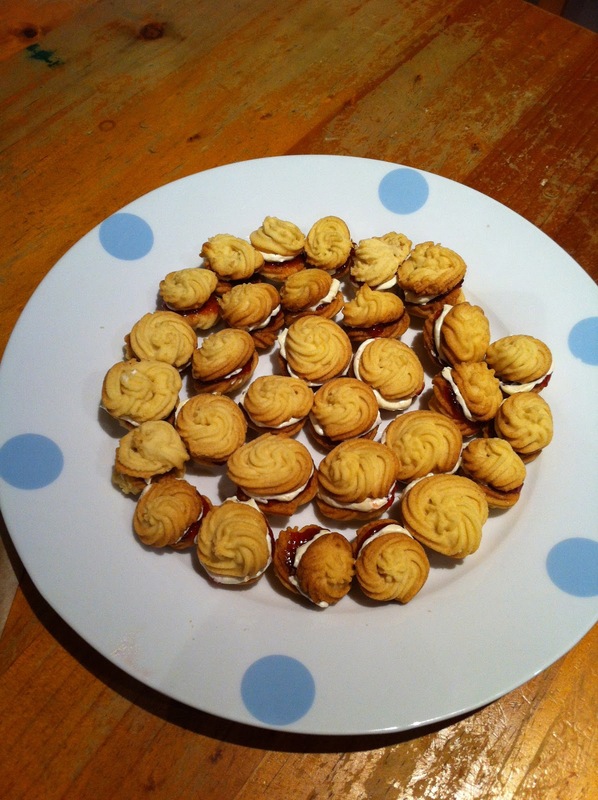 5cm diameter whirls take 12 minutes. 1. Simmer milk and add flour. Stir until all flour has dissolved. Lay onto plate and cover with cling film until warm/cool. 3. Add in the milk mixture to your butter and sugar, whisk well until all is mixed it. 4. After your whirls have cooled spread a thin layer of jam to one side, then some cream mixture to the other and squish together. 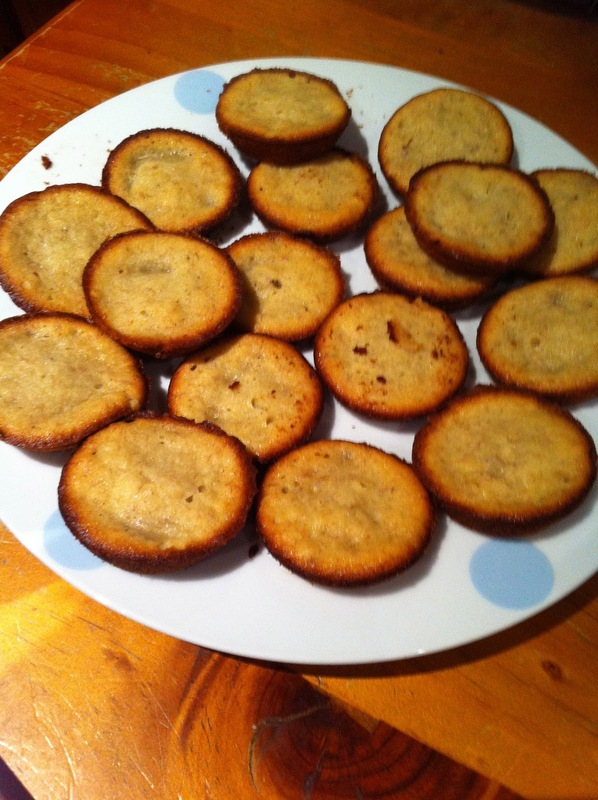 Banana cakes look so delicious!! I'm hungry and seeing this post just made me hungrier, lol they look like they tasted real good Erica. its almost 4 a.m. here in india and looking at your post my mouth is watering irresistibly! going to try out your recipe tomorrow and going to follow you right away! Thanks! I'd love to, I"ll pop over! What did you mean with 'have you hear the new matte about you?